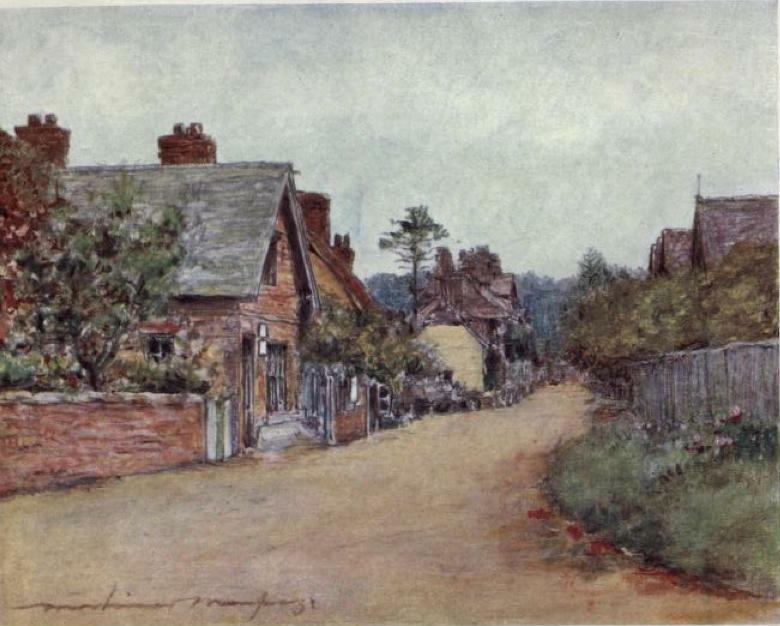 Sonning by Mortimer Menpes, R. I.
Sonning was one of the artist William Holman Hunt's "favourite haunts" (Amor 262). His daughter Gladys designed a pretty cottage for him there, where he and his second wife Edith spent their summers from 1901 onwards, reading, walking and entertaining guests. Hunt also painted here, until his eyesight failed, working on his large version of The Light of the World for St Paul's Cathedral here. Amor, Anne Clark. William Holman Hunt: The True Pre-Raphaelite. London: Constable, 1989. Menpes, Mortimer, R.I., and G[eraldine]. E[dith]. Mitton. The Thames. London: A. & C. Black, 1906. Internet Archive version of a copy in the University of Toronto Library. Web. 18 April 2012.